Manitoba's commitment to establish a network of protected areas to represent each of our natural regions began in 1990, when the province became the first jurisdiction in Canada to commit to World Wildlife Fund Canada's Endangered Spaces Campaign (ESC). At that time no Manitoba provincial park lands were protected from development. 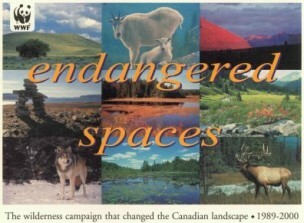 Riding Mountain National Park and the existing ecological reserves were the only public lands in the province protected [to the Endangered Spaces Campaign standards] from development. The protection standards for the ESC became public policy in Manitoba. Today, these protection standards are the basis for protected area designations. Manitoba's Protected Areas Initiative (PAI) aims to represent each of the province's terrestrial natural regions through its protected areas network. Designation for protection under Manitoba's PAI prohibits all resource extraction activity within the protected area. In spring 2000, Manitoba's Protected Areas Initiative program was extended. Cross Lake, MB - by Will Braun The province's Action Plan for a Network of Protected Areas, updated in 1996, 1998 and 2000, provides the public goals, and ecological standards and methods used for design, assessment and establishment of protected areas. The Action Plan also includes the systems approach to review old designations, upgrade regulations and outline the variety of land designations that can be used to establish protected areas. The Action Plan also includes the ecological approach to completing networks of protected areas for each natural region in Manitoba. Despite written promise by Conservation Minister Struthers, the Action Plan has not been updated. Manitoba Wildlands assumes protected areas goals, methodology, and existing area of special interest continue. 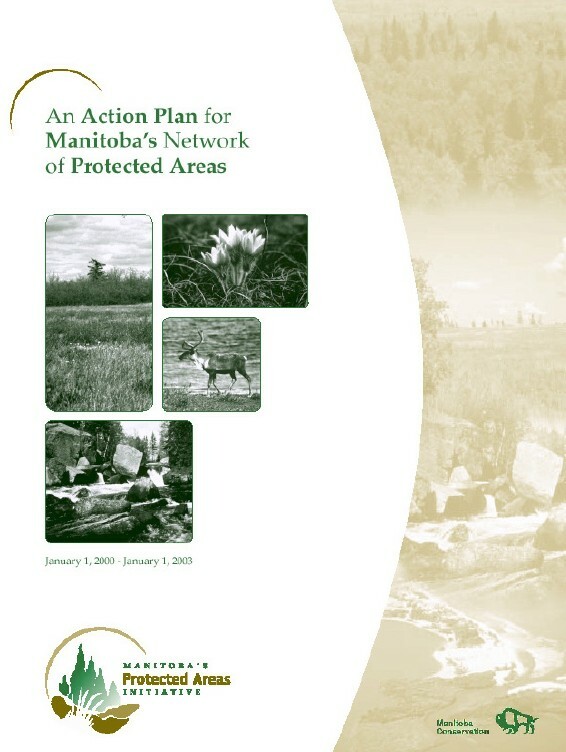 View the 2000 - 2003 Action Plan for a Network of Protected Areas, which currently guides protected areas establishment while Manitoba Conservation updates it. 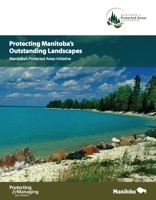 2009 is the first year since 1999 of significant progress in the rate Manitoba's protected areas establishment. Between 2006 and January 2010 769,881 hectares were protected with the annual largest increase coming in 2009 with 6 new protected areas, an increase of 407,502ha since 2008. In contrast, between 1989 and spring 1999, 4, 891,500ha of Manitoba lands and waters were protected, a 7.6% increase between 1989 and spring 1999. From 1999 to 2008, the percentage of protected areas in Manitoba stagnated at an increased only by 0.1%, but 2009 saw the largest increase in new protection in a decade at an increase of 0.58% bringing the total Manitoba Protected Areas to 8.8% of the province. 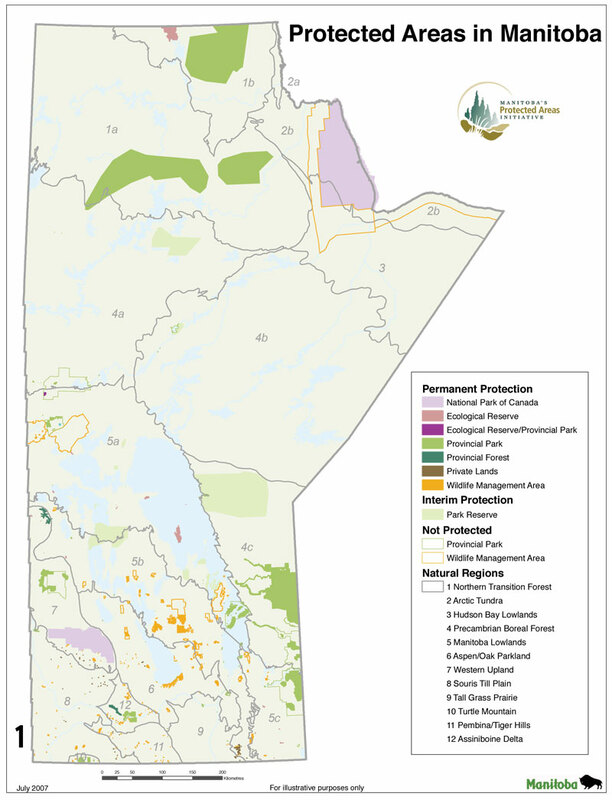 Networks of protected areas within Natural Regions in Manitoba are not complete. Our boreal forest regions present the biggest opportunity, and biggest disappointment to date, significant progress towards protected areas is still outstanding. 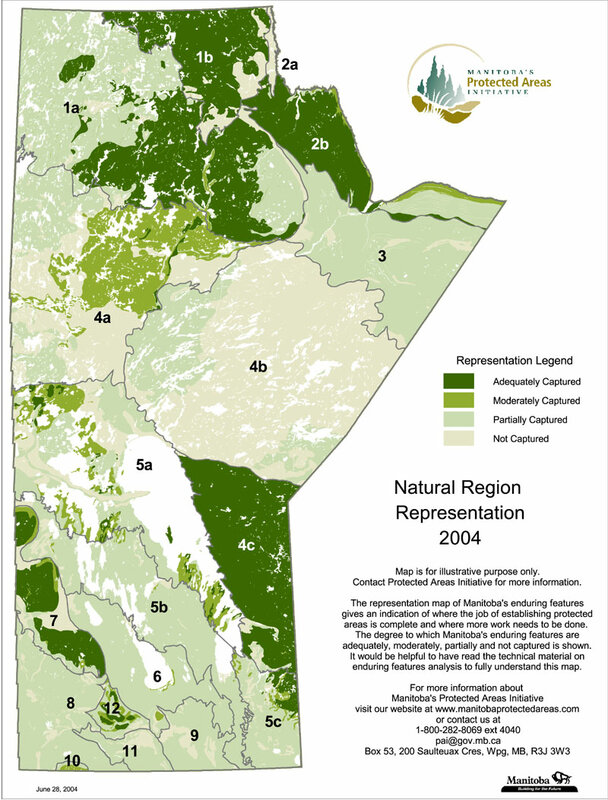 In spring 1999, protected areas comprised 5,241,5000ha of Manitoba's lands and waters. By January 2010, 5,729,460 ha of lands and waters are protected. View the Protected Areas Audit web page. Administrative decisions to extend or finalize interim (temporary) protection already in place prior to 1999 only count once in protected lands statistics. Manitoba Wildlands continues to issue an annual protected areas grade regarding government action on these commitments. This grade has been based on the same criteria since 1992. View the Protected Areas Grade web page. 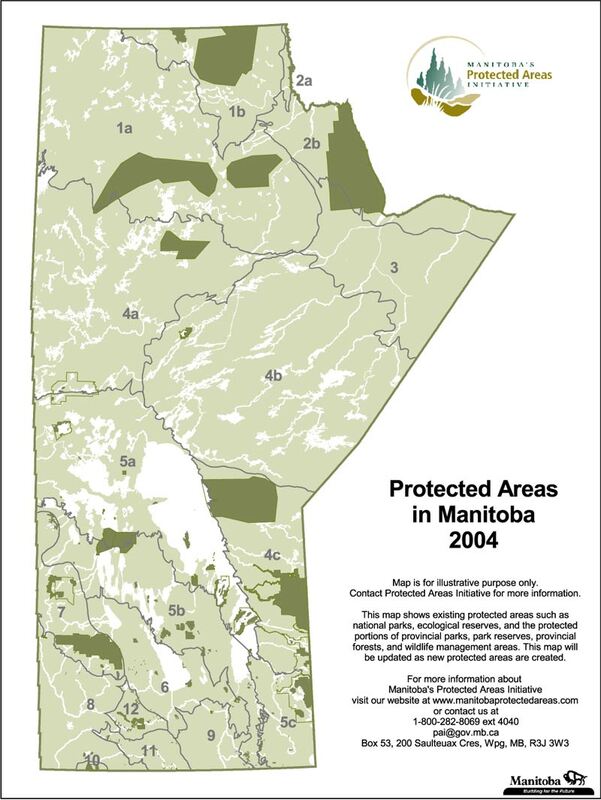 Maps showing Manitoba Protected Areas 2008, 2007, and 2004 are provided below. Manitoba Conservation is lead agency of the Manitoba PAI. Study areas called Areas of Special Interest (ASI) are designed for possible protection. 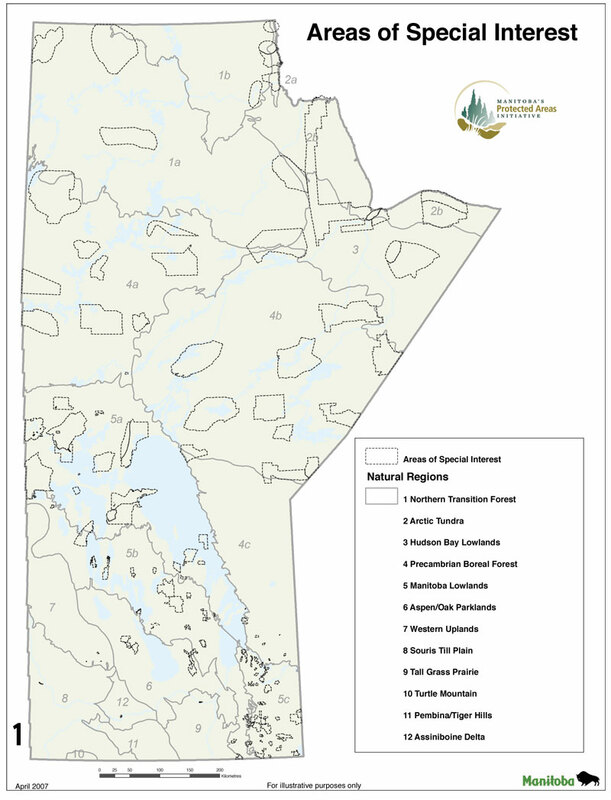 Protected areas in Manitoba, public or crown land designated by government, can be designated under: Ecological Reserves Act, Wildlife Act (wildlife management areas), Parks Act, Forest Act (zones in provincial forests). National parks in Manitoba are designated under the Canada's National Parks Act. The regulatory language must confirm that designation of an area protects the area (combined lands and water) by prohibiting mining, logging, hydroelectric, oil and gas development (including exploration activities), as well as other activities that could significantly and adversely affect natural habitat. This means that roads, bridges, build infrastructure, town sites etc contradict protected land status, and do not occur inside an area designated as protected. 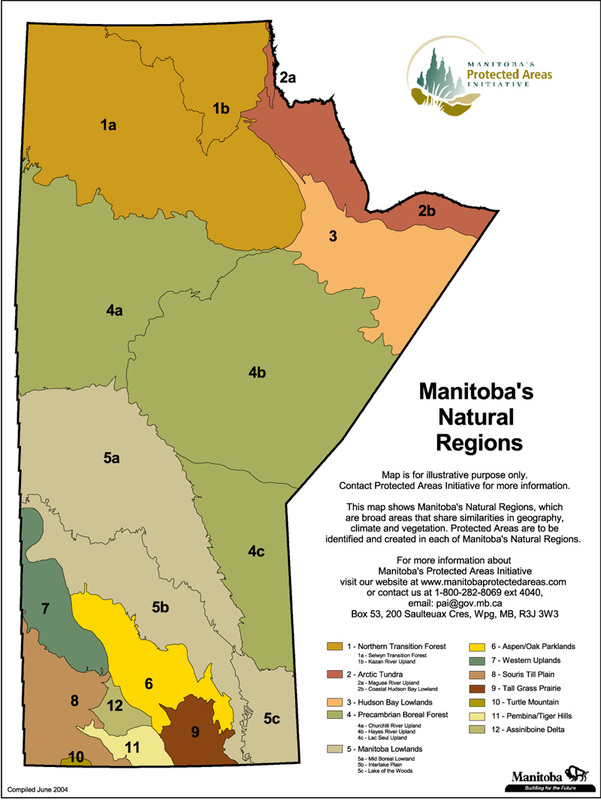 All protected areas in Manitoba have crown mineral rights withdrawn also. This means that at least two regulations under two Acts are required for public or crown land protected areas in Manitoba. Private lands protection is usually a function of agreements with government, and similar steps to meet the protected areas standards, including withdrawal of crown mineral rights. To date there are no standards for marine or water based protected areas, and open bays in park reserves are therefore not protected from development. Lakes and rivers within protected areas are protected from development by the same regulations that protect the lands. 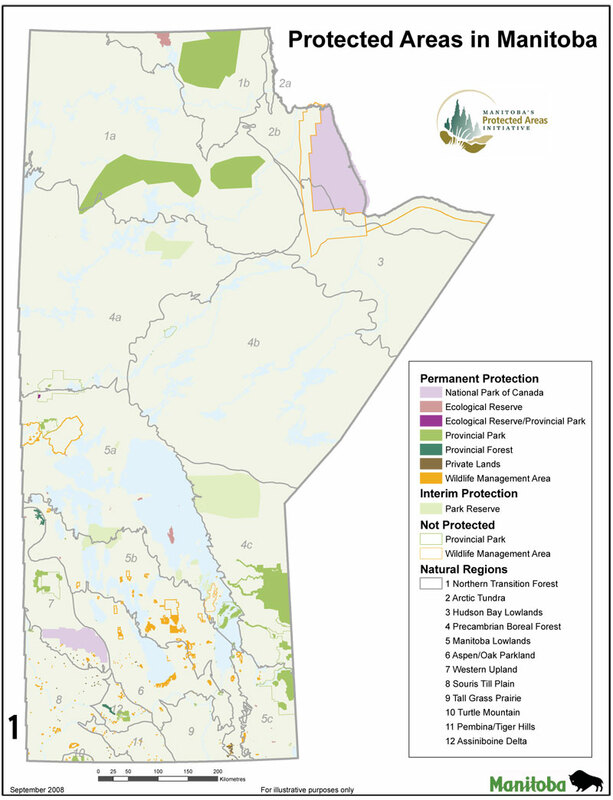 See Manitoba's Protected Areas Initiative web site for these maps and more information. Manitoba Conservation released Protecting Manitoba's Outstanding Landscapes in early 2008 as an update on the province's protected areas network and commitment to establish protected areas network in each of the province's natural regions. The publication contains maps showing the priority regions for protected areas establishment, and the system of areas of special interest. (ASI). These ASIs include over 100 areas waiting for decisions on protected status, including over 10,000,000 acres, which the Mining Sector in the province has recommended for protected status. While protection standards and definitions are largely accurate, the report implies that provincial forests are special areas contributing to protection of biodiversity. 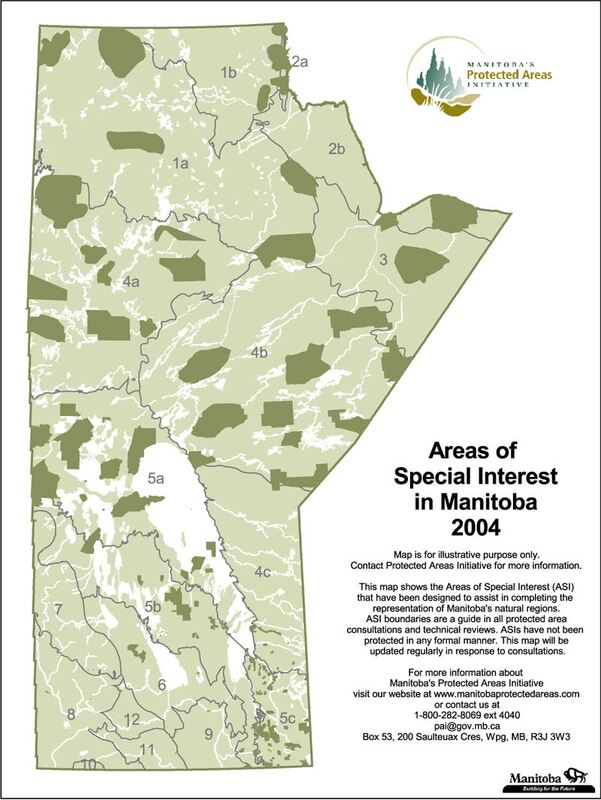 As of early 2009 there are two relatively small protected areas within provincial forests in Manitoba. Environment and conservation organizations in Canada often apply the Conservation First Principle to their efforts for decision-making in Canada's forest regions. Initiated by WWF Canada, the Conservation First Principle is identified in public lands planning materials, including for the MacKenzie Valley, or at the start of significant bioregional lands planning programs. The Manitoba mining sector has participated in technical reviews for new protected areas since early 1998. Approximately 8% of Manitoba's landmass is in protected status. Manitoba led all Canadian jurisdictions in the percentage increase of land protected during the WWF Canada Endangered Spaces Campaign. An additional 6% is supported for protection by the mining industry as Rank 1 ASIs or sector nominated areas. These have been placed in "withdrawal pending" status by the Mines Branch. The Mining Sector Rank 1 ASIs currently total 4 million hectares or 9.9 million acres. The lands in which exploration is restricted are shown on the accompanying maps. 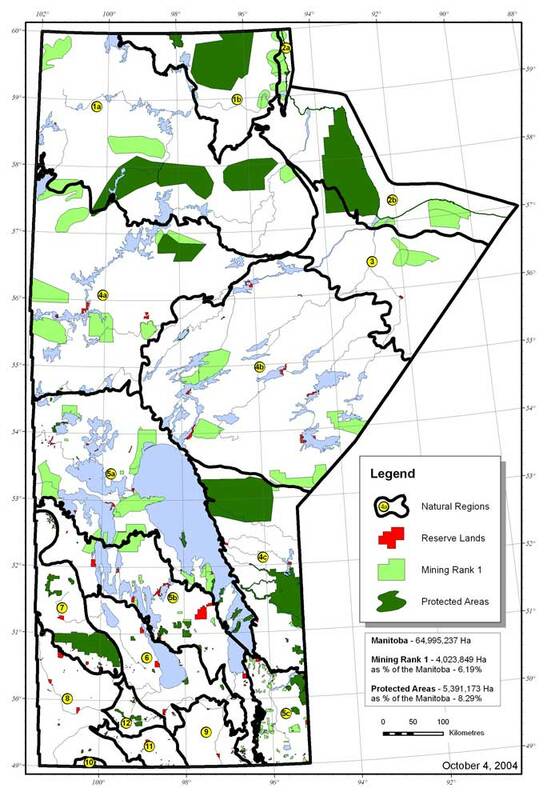 Manitoba's long standing Mineral Sector Protected Areas consultation continued to review and rank Areas of Special Interest and upcoming protected areas options in 2004 and 2005. 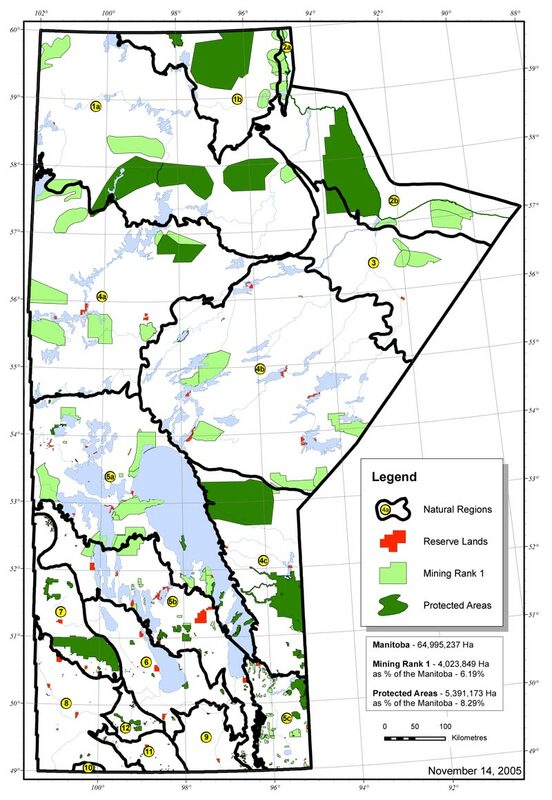 We have provided links to recent maps showing the cumulative output of lands ranked by the mineral sector, and new mapping for the natural region at the south east corner of Manitoba. 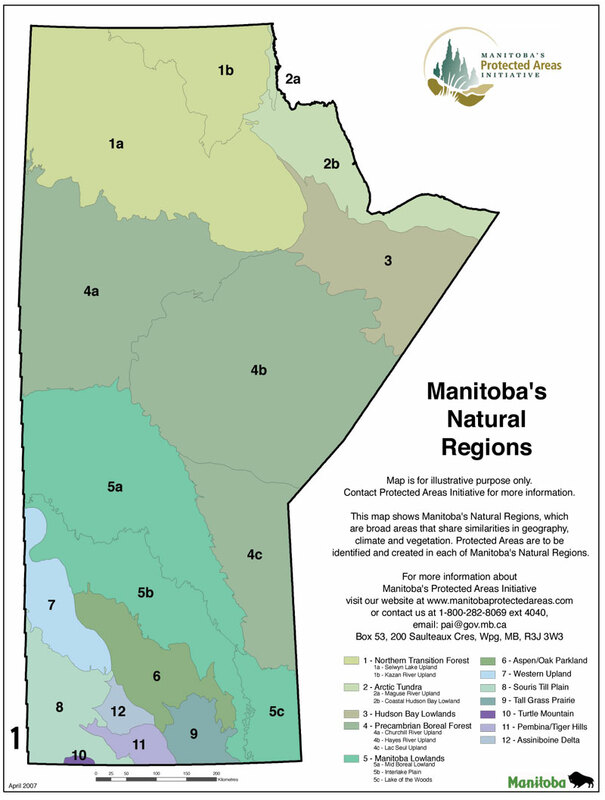 To date, there are NO marine or inland water protected areas in Manitoba. Our province has thousands of rivers, bogs, and streams, as well as over 100,000 lakes. Bodies of water within a terrestrial protected area are assumed to be protected from development. No 'water use' or 'water protection' classification exists in the Manitoba Parks Act. Often water in bays, for instance, is classified for Recreational Use. Heritage Marshes in Manitoba sometimes are covered by a regulation protecting them from development. There is no cohesive management or protection system for these marshes. Significant opportunities for marine protected areas exist in Manitoba, including adjacent to Wapusk National Park within Hudson Bay, and in the potential boundaries for the new Lowlands national park, at the top of Lake Winnipeg. In the fall of 2000, Fisheries and Oceans Canada (DFO) initiated a management planning process for the Hudson Bay region. The plan for the region should identify potential sites for future marine protected areas adjacent to Wapusk National Park. Participants in the process include representatives from the Nunavut Government and various federal departments (Parks Canada, DFO, Transport Canada, Environment Canada, Indian and Northern Affairs Canada), representatives from Manitoba Conservation, York Factory First Nation, the town of Churchill, Canadian Circumpolar Institute, Kivalliq Chamber of Commerce, among others. No environmental or conservation organization is participating in the planning process. The management plan is expected to affect a number of Areas of Special Interest (ASIs) in Manitoba (#117 Marsh Point Proposed Ecological Reserve, #122 Seal Estuary, #123 North Hubbart, #124 Catton, #125 Nunalla, and #128 Cape Tatnum Wildlife Management Area) as well as the Wapusk National Park. See the Natural Resources Institute: Ocean Management Research Network for details in this process including a listing of the participants on the Working Group.